Tomorrow is National Running Day. Today seems like as good of a day as any to write about running. Plus, very soon I’m going to get to run with a very special person and I’m really excited about it. I just read most of the new Runner’s World magazine issue, which means the last item I read was their “I’m a Runner” column. I’m going to use that format. I don’t have one, but I prefer distances between 10k and 25k. I think my least favorite distance is the marathon, which I’ve never done. On the one hand, it’s a pretty standard test for a runner, so I feel that I should do one. However, the weather in Minnesota, and the other activities I like to do as well, make the idea of training for a marathon a really complicated, aggravating, idea. Perhaps it’s not the best test for me. Plus, part of me, likely the Oregonian, needs to be contrary. Standard, schmandard. I’ve spent over three hours running in a few trail runs; that’s plenty of fun and challenge, and recovery hasn’t been a problem. Three hours is worth at least one cinnamon roll from Isles Bun & Coffee. That was the 2nd best part of doing the Trail Loppet, my first half-marathon. The best part: finishing on my feet. I was terrified of turning an ankle on my very first trail race – my depth perception is awful. One that will likely forever remain unattainable: to finally get a time that would have earned me a letter on my high school cross country team. If I remember correctly, this means breaking a 7:30 mile split on a 3-mile trail course. Five years ago, briefly, I thought I could do it. Now, I’m pleased to place in my age group – or even to be in the top third of it. Currently, I’m training to beat a 2:00 half-marathon time on a July 4 race; my last 13.1 time was 2:02 on a trail race, 2 years ago. I hope it’s not hot, that morning. 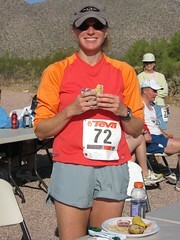 For trail races, my goal is usually to finish, to manage my fluids and fuel well, and to be smiling at the end. Those can be long races. For overnight relays, I aim for pace PR’s on the first two legs, but my main goal is just to keep running for the whole third leg. Exhaustion-fueled sideaches are worthy enemies. So are hallucinations. That turtle was HUGE. You run on roads and trails? Yes. I live in the city, but there are some great parks nearby. Many of my running years have been spent on hard surfaces: pavement or rock-hard rugby fields. Maybe I can extend my running years by spending some time on softer turf. Plus, I just love the difference of running on trails. For example: It’s the only time that I like the sensation of spider web on my face. It’s a sticky, smiling, I’m-a-kid-on-recess sensation that I never get while running on city streets. I’m pretty much guaranteed to get it on a run out in a park, especially if I go in the morning. If it happens while not on trails it’s likely to inspire a full-body thrash that could result in injury and/or the removal of some clothing (it was a really big web. And I had no idea where the spider of unknown size was). Time just flies by when I’m running on trails. When I keep my eyes and attention on the terrain, trying to avoid tripping on roots or getting clotheslined by a fallen branch, I’m often surprised by how much of the day passes before I’m back to my car. Though I do forget on road runs, when I’m on trail I don’t forget to fuel up at regular intervals. A mid-run treat, whether it’s an Espresso Love Gu or a Fig Newton, provides a great opportunity to stop and enjoy the scenery. There are things you don’t want to miss, like an orchid, a crawdad, or a horse. What’s the furthest distance you have run? In one leg/race? 17 miles: last year’s Surf the Murph trail race. But in 24 hours? Somewhere around 23 miles, in the Ragnar Relay Great River, 2 years ago. I ran at noon on the first day, around 11pm that same day, then again around 7am the next day. Got one hour of sleep total! That last leg is killer, but I find comfort in the fact that it’s supposed to be that way. It would be entertaining to watch a video of myself on that leg. I don’t remember any of the three last-relay-legs I’ve done, very well. What the best race goodie you have received? The breakfast burrito at the finish of the Cactus ChaCha. 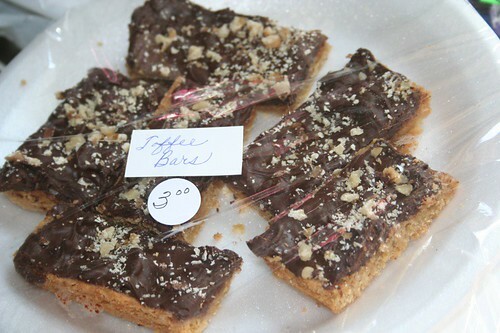 Or maybe the bake sale that is always a part of the Big Woods Run. The goodies I don’t have to store are fantastic. I won a raffle prize of some homemade apple butter at that race once. That said, the Afton Trail Run t-shirt that I received for volunteering last year, it’s been my running shirt of choice, since then. I love the art on it, and love the cut and feel of the t-shirt itself. John Storkamp, the race director and t-shirt artist, did well with that one. When did you first race? Some race with my Dad. Likely, the 10k Heart Run in Tacoma, or maybe one of the races that he helped organize at a physician’s convention that our family attended. I remember doing one of those in Colorado Springs. Do you know the elevation difference between Tacoma and Colorado Springs? We should have arrived there more than one day before the race. My dad rocks. He’s been running in this one race in our hometown, the Sound to Narrows, every year that it’s been held. 40 of them, this year! I’m pretty sure that he’s the reason I picked up running. If your dad is a heart doctor, and he runs, that’s a pretty powerful endorsement. As I kid, I liked going to the start and finish line, to support him. It was such a lively, festive environment. Weirdly, I didn’t run that race until just a few years ago. It’s a tough one! So, track was a big part of your life, in school? No. Well, scratch that. I was horrible at sports involving balls, so I didn’t consider myself an athlete, even though I was damn good at downhill skiing. But I did track & field in junior high, and enjoyed many events, including hurdles, high jump, long jump and perhaps the 800. I wasn’t exceptional, but I competed. Same deal with high school cross country, though I only did that for two years. My school‘s team was ridiculously good; I felt lucky to be a part of it, but I also felt like an impostor. My schedule during my junior year got nuts, and I ended up removing cross-country from it in favor of more geeky things like speech & debate, and work on the high school newspaper. I didn’t compete again in running, specifically, until over 20 years later. This is partly because at about age 18 I finally developed hand-eye coordination and discovered rugby. I likely ran several marathons’ worth during those 11+ years of rugby. What got you back into the running shoes? After retiring from rugby, I took a break from running. Hiking and rock climbing were very appealing and fun, and I made some great new friends doing that. But one summer, the local Y did a fitness challenge, and I participated. What you had to do, was complete an entire ironman triathlon, over a summer. Over two months, you had to swim 2.4 miles, bike 112 miles, and run 26.2 miles. That ended up not being all that difficult for me, and by the time I finished it I thought damn, this is too easy – and damn, running is fun. So I signed up for a 5k, thinking maybe I could attempt to beat my high school cross-country best time. I’ve come close. In a 5k, a year later, I made it to the finish line before my husband could get there to cheer me on, as I finished. I found him shortly later, bagel and banana for me in hand – but with that finish, I felt speedy, maybe speedier than I did at age 16. Yeah!